Director Samuel Fuller's Hell and High Water may not constitute great art, but as a long-dead colleague from that era might have said, it's one hell of a picture. Outrageous and original, despite familiar genre trappings, it's a Cold War suspense thriller that partly (and very successfully) demonstrated the possibilities of the then-new CinemaScope widescreen format. It's tense and exciting throughout, with a couple of moments of still cringe-worthy violence, and it's probably the only fiction film made to date that both opens and closes with atomic explosions. Critics didn't think much of Hell and High Water for many decades, but today most laud Fuller's distinctive touches throughout and admire the camerawork and obvious but plentiful and undeniably spectacular practical special effects. Panned-and-scanned versions obviously didn't do the picture justice, and Blu-ray is really the first home video format that one can fully appreciate its widescreen epicness. As the free world follows the search for missing French atomic scientist Montel (Victor Francen, a role intended for Charles Boyer), former World War II submarine commander Adam Jones (Richard Widmark) arrives in Tokyo, after receiving a mysterious package containing $5,000. At a darkened warehouse near the airport he's met by a group of international activists, including Montel and his beautiful assistant, Professor Denise Gerard (Bella Darvi). "What makes a girl like that get mixed up in science?" asks Jones. They're convinced that the Communist Chinese are building a top secret atomic base on a remote island between the northern tip of Japan and the Arctic Circle. They offer Jones an additional $45,000 to deliver Montel and Gerard to the suspected island to confirm the base's existence, using a refitted Japanese submarine salvaged after the war. Mercenary Jones agrees, with the conditions that the sub be armed, and that he be allowed to handpick his crew. En route the international, unsanctioned international crew face one peril after another: a Red Chinese submarine in a game of cat and mouse, scenes that perhaps influenced later movies like The Enemy Below (1957) and Das Boot (1981). Once they reach the island things get even more hairy when it's discovered the Chinese plan to drop an atomic bomb on Korea or Manchuria using a captured (or recreated) B-29 bomber and blame it on the U.S. of A.! The submarine tropes soon give way to proto-James Bond commando action, and it doesn't disappoint. Seen today, most ‘50s Hollywood Cold War thrillers are good only for laughs, high camp even, with their hysterically over-the-top depiction of the communist menace and the flag-waving, square-jawed heroes (often John Wayne) who fought them. Movies like Jet Pilot (1957), Red Planet Mars, and Big Jim McLain (both 1952) are fun because they're so ridiculous. Hell and High Water bears almost no resemblance to those movies but does have the comic book feel of publications like E.C. 's Two-Fisted Tales (1950-55), created by William Gaines and Harvey Kurtzman. Director Fuller, an infantryman in the Big Red One (later the source of his 1980 autobiographical film) knew a thing or two about combat, and by 1950s Hollywood standards brought a much-need air of verisimilitude. Fuller, who agreed to direct on the condition that he could rewrite the script, added vignettes based on stories he heard from real submarine veterans, including a still wince-inducing hatch accident that, while hardly graphic, probably had little old ladies in theaters fainting dead away. A later murder is similarly gruesome. 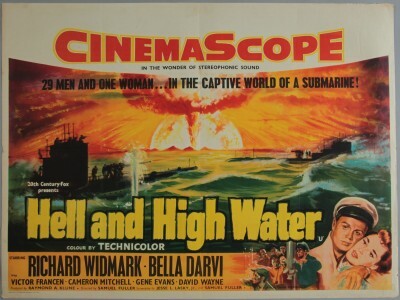 The politics of Hell and High Water aren't exactly subtle, but they're nonetheless quite different from other ‘50s Hollywood Cold War thriller. Scientists in those films either were on the front lines eagerly stockpiling America's nuclear arsenal or if, like J. Robert Oppenheimer, they actually questioned the wisdom of nuclear proliferation, they were depicted as pinko dupes. The scientists in Hell and High Water undertake a covert mission that the U.S. officially can't, yet their aims never appear anything other than noble. The script wisely counters this with Widmark's caustic, sardonic mercenary, who regards them as dangerously foolhardy. The movie plays to Widmark's joint strengths and limitations as an actor, incapable of much warmth but packed to the gills with barely contained contempt toward virtually everyone. Apparently, ‘50s audiences were expected to relate to him more than the dedicated eggheads and peacemakers, a Han Solo minus the rakish charm who sheds his mercenary exterior through osmosis aboard the claustrophobic sub. The comic book look of the picture and Fuller's unforgiving approach makes the handful of stock genre situations almost palatable. The most ridiculous and obvious of these concerns a loveable ukulele-playing Chinese-American (Richard Loo) who with painful earnestness selflessly volunteers for a dangerous mission, solely out of worshipfulness to Widmark's character. Fox contractee Cameron Mitchell plays the clichéd dimwitted loudmouth who falls in the love with Gerard, unaware there are already sparks a-flyin' between her and Jones, consummated in a cleverly shot bathed entirely in silent-running red. Fuller regular Gene Evans is Jones' loyal second in command. The movie cleverly offers new-to-CinemaScope audiences nice travelogue-like vistas of several European capitals in the opening sequence, Fuller apparently having been impressed by early CinemaScope footage shot for How to Marry a Millionaire and perhaps other footage. This gives way to mostly soundstage exteriors and elaborate special effects that, though variable, are mostly highly satisfying. Twilight Time's Blu-ray, licensed from Fox, lists a 2.55:1 aspect ratio that, on my projection system at least, looks more like 2.35:1 with the extreme edges of the frame optically squeezed ever so slightly. It's nonetheless an excellent transfer, sharp with color that really pops, especially the opening titles. The 5.1 and 2.0 DTS-HD Master Audio (English only, with optional subtitles) booms with all the directionality and fullness of the original 4-track magnetic stereo prints. This edition is limited to 3,000 copies and is region-free. Supplements include a repurposed A&E Biography on Richard Widmark, an isolated track of Alfred Newman's fulsome score, original trailers, and Julie Kirgo's usual liner notes. A potboiler in the very best sense of the word, Hell and High Water is a DVD Talk Collector Series title.